...And we're back! "Where have you been?" we hear you cry in your hoards. "No posts in a whole month?" 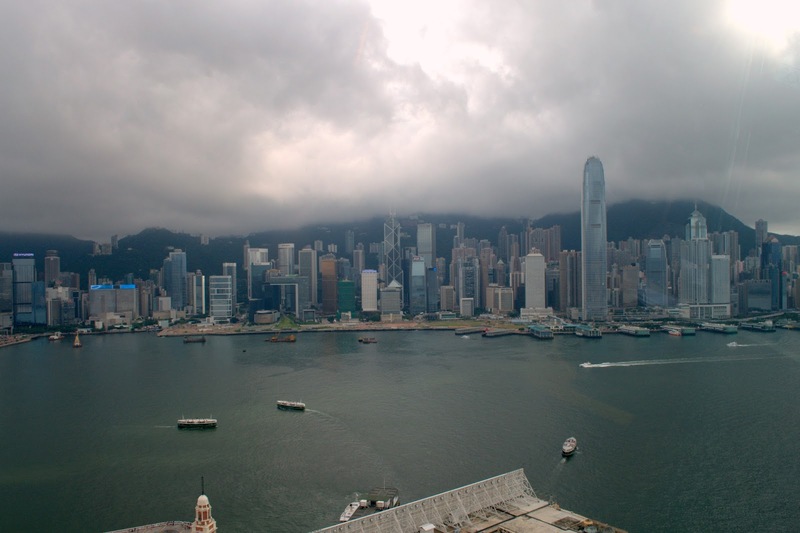 To this, we can only offer up our apologies and what we hope is a fairly legitimate excuse: we've been on the other side of the world, in what turned out to be possibly The Best Holiday Ever to China and Hong Kong. We spent around two and a half weeks travelling, beginning with a few days in Hong Kong, a city we fell in love with. After that, we headed into mainland China, travelling around Sichuan and making further stops in Guangxi and Guangdong provinces before reluctantly heading back to London. Luckily for us, flatmate T and his girlfriend L have recently come back from six months in Hong Kong, and kindly provided us with a brilliant itinerary for our few days there. 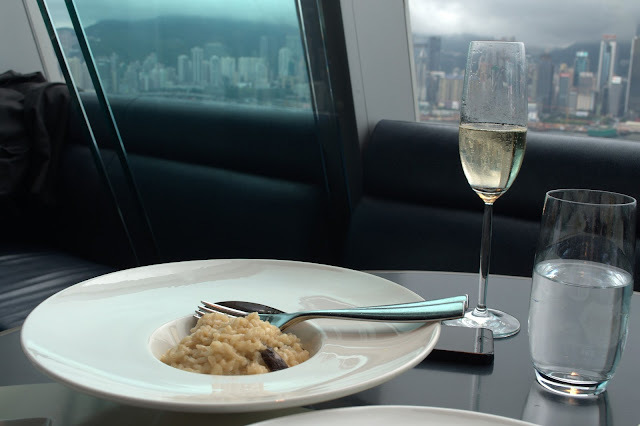 One of their recommendations was a Hong Kong Sunday brunch, so we booked into David Yeo's Aqua for a Champagne Infinity Brunch, which we thought sounded like something we might fancy after a long-haul journey. After a 13 hour flight to Chinese Guangzhou, a bustling train ride into Hong Kong and an off-the-scale humid taxi ride, we stumbled into the tranquility of Aqua, backpacks 'n' all. In hindsight, we must have been quite a sight, but the accommodating staff took our backpacker attire to the cloakroom without any fuss and showed us to our table. 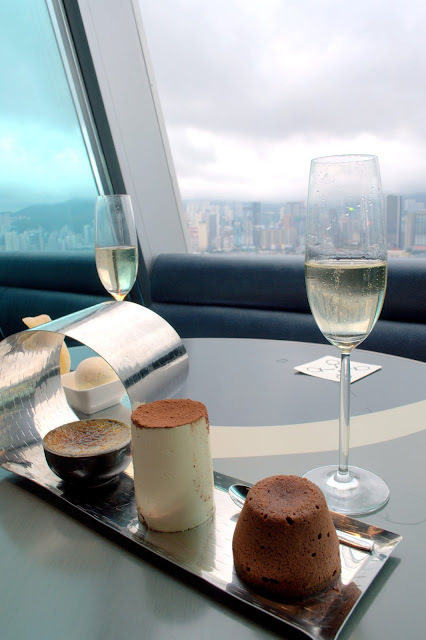 Without a fraction of a doubt: every jet lagged visitor to Hong Kong should experience a Hong Kong Champagne Sunday Brunch on their first morning in the place. For $598HK a head, which equates to around £50, guests enjoy a limitless selection of dishes served fresh to tables with G.H.Mumm Cordon Rouge champagne, a choice of red or white wines and a selection of cocktails. 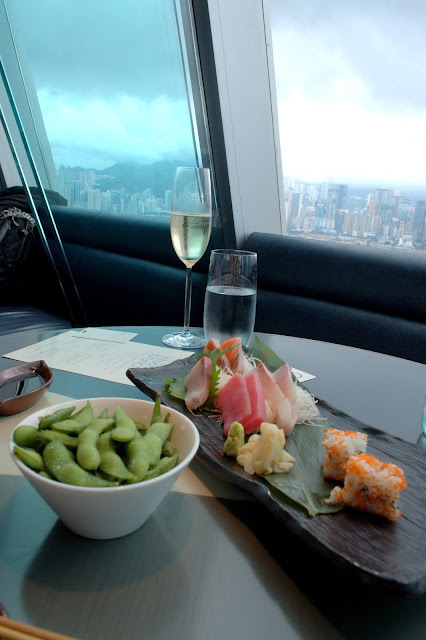 Add to this the stunning view over Hong Kong's Victoria harbour - Aqua's situated on the 29th and 30th floors at One Peking Road in southern Kowloon's Tsim Sha Tsui and features floor-to-ceiling glass windows - and it makes for an extremely indulgent experience. We're not usually ones to splash out £50 on a meal, but in this case we'd certainly say it was worth the money. Aqua was named one of the 'Hottest 100 Tables in the World' by Condé Nast Traveler magazine, and we can definitely understand why. 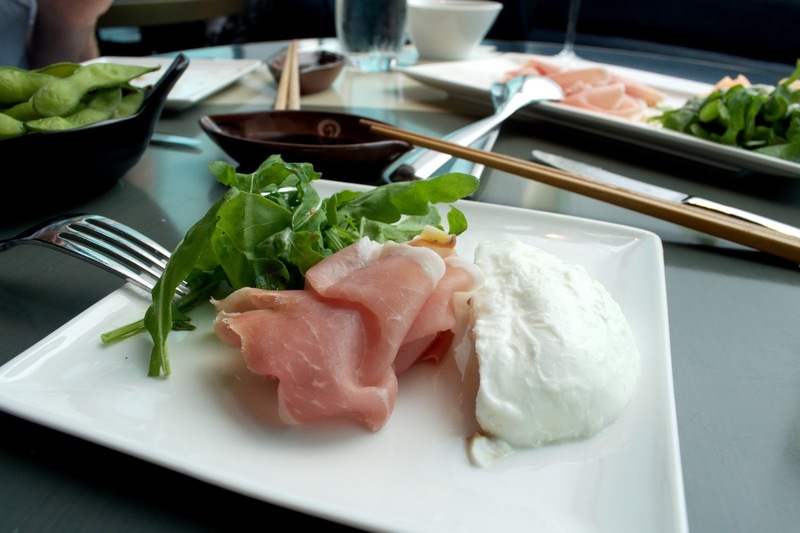 The food itself is Italian-Japanese fusion, named 'Aqua Roma' and 'Aqua Tokyo': a slightly odd concept, the trick is just to go with it. 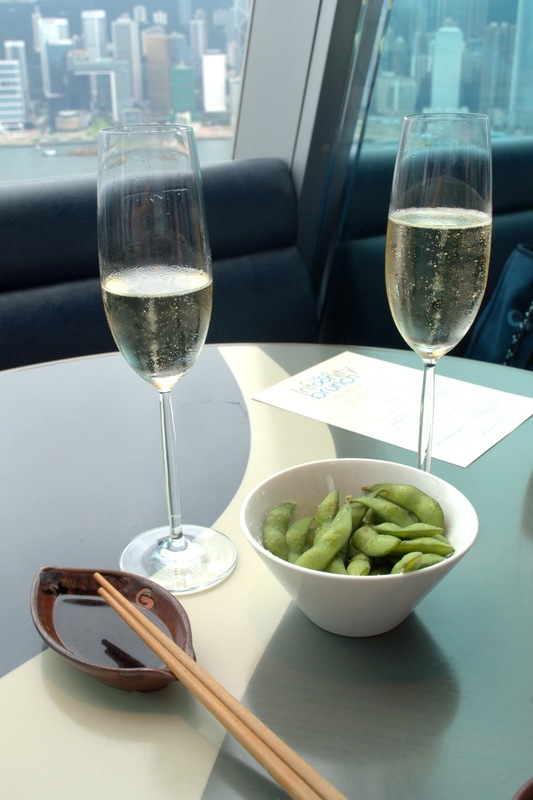 After a starter of edamame beans and a glass (or three) of champagne, we started with a sushi and sashimi platter, which A in particular lapped up. 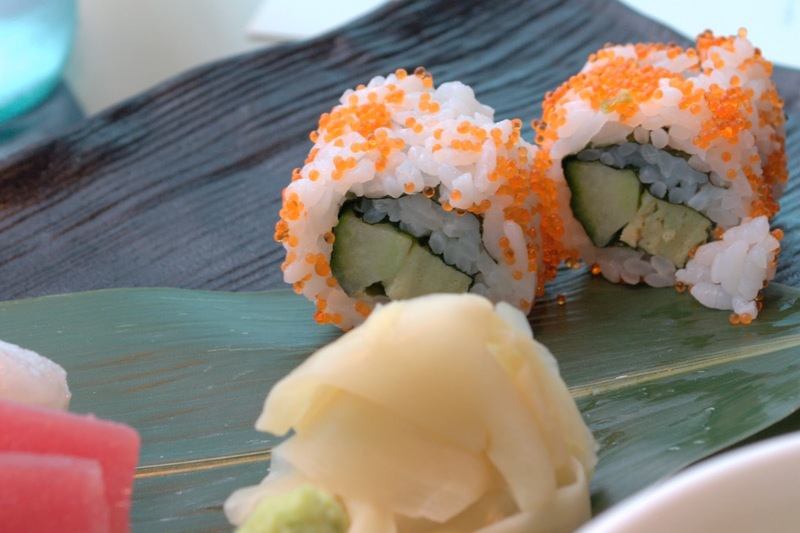 Fresh raw fish and a sushi selection was presented absolutely beautifully, and made for a great appetiser. Next came the slightly heftier Italian antipasto platter: this was more C's thing, and she made short work of the fine sliced parma ham served with creamy buffalo mozzarella, rock melon and fresh leaves. Then we were onto the pasta section: three wonderfully presented and equally appetising dishes. 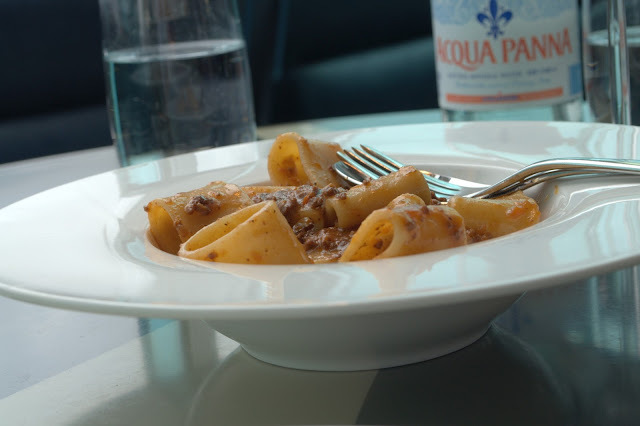 C's favourite was the Paccheri "Verrigni" - a large, hollow, tube-shaped type of pasta - cooked perfectly al dente and tossed in an aromatic duck ragout infused with orange and rosemary. To say it was tasty is an understatement: C made the most of the 'infinity' element by ordering a second serving and finishing that off as well. A's favourite of the pasta selection was the homemade ravioli, filled with puree of carrot and tossed in a spicy gorgonzola cream with balsamic syrup. Again, this was perfectly al dente and the unusual hot gorgonzola cream guaranteed to appeal to any open-minded fans of both blue cheese and spice. We also enjoyed the perfectly cooked, creamy risotto with wild mushroom and 24 month aged Parmigiano. 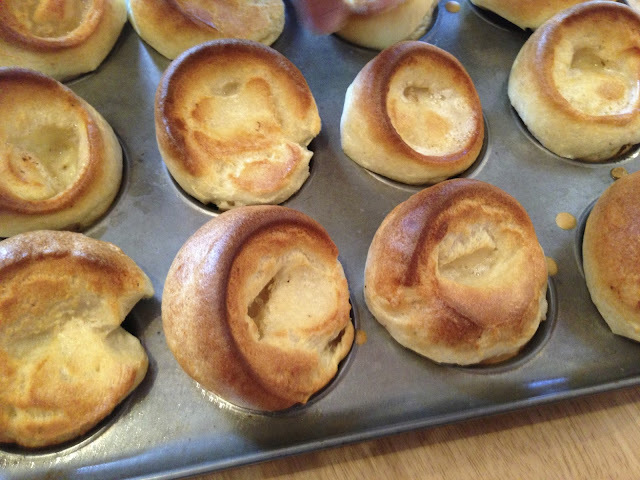 Next, we were onto the mains. Our stomachs were already pleasantly full, but the selection of six - of which we initially were asked to choose one each, and then given the option to order any further dishes we wanted after this - all sounded appealing. After much deliberation, A went for the pan fried pork loin ginger teriyaki, which didn't disappoint with the depth and strength of flavour and texture. C opted for a simpler, Western dish of roasted free range spring chicken with sauteed spinach, roasted potato and a light spicy sauce, which was cooked to perfection and was tender yet moist. In particular, she was impressed by how well the spinach was done: there was no hint of sogginess which so often puts her off the vegetable. 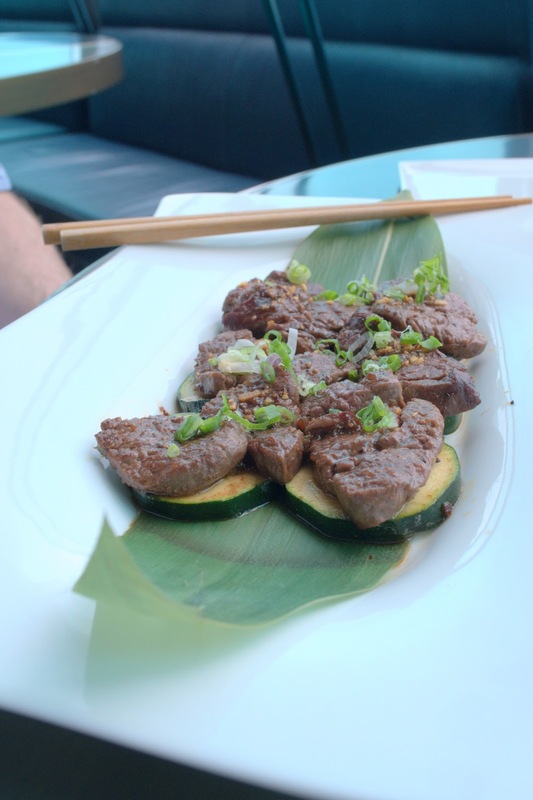 We ended the meal with an extra main: a grilled beef tenderloin with spring onions. Impressed by its presentation, the taste of the meat lived up to expectations too, and although simple the dish was one of the stand-outs in terms of flavour. And lastly, we were onto desserts: a selection of five, once again presented beautifully. It's worth noting that Aqua clearly pays more attention to its savoury mains and antipasti than its dessert offerings as these failed to live up to quite the standard set by the earlier courses. However, that's not to say that they weren't great: A was a fan of the tiramisu, while C was intrigued by the extremely sour lemon sorbet (just her kind of thing) and the oozing chocolate pot. There's no rushing in this restaurant: you can order food up until 3pm, and then finish eating and continue drinking for as long as you like. We believe we left around 5pm, although our memories are admittedly a little hazy after a good five hours drinking. Suffice it to say that if you're ever in Hong Kong, head to Aqua and experience their Infinity Brunch: you won't regret it. 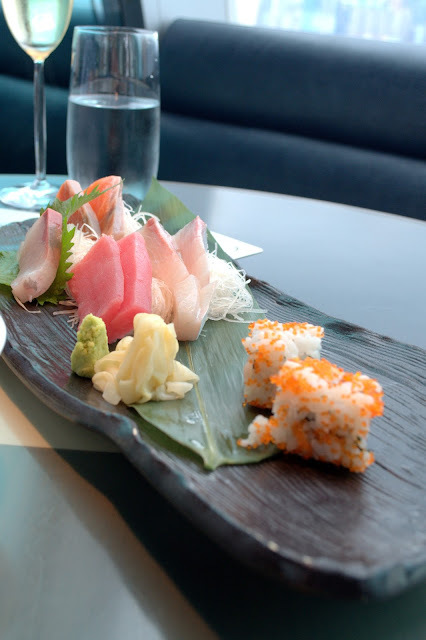 There's also an Aqua in London, although we haven't been to it: given the experience at its Hong Kong counterpart, though, it might be one for us to check out very soon. Goodness what a wonderful way to get over jetlag. A relaxed long meal and a great view. If I go to hong long it is on my list! That sounds and looks wonderful, talk about the perfect way to spend your time after a long flight.